Instant Bento! 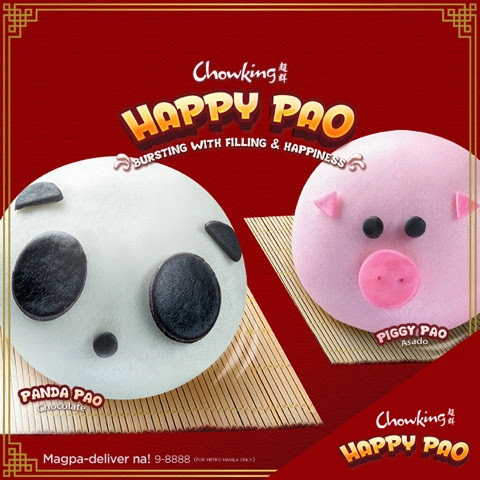 Happy PAO by Chowking - Triple Joys!!! I have been seeing this ad the past few weeks, and it really tickled my curiosity. Why? Because the first thing that came to my mind when I saw these cuties was Bento! Bento-making is so "in" right now and I've really been wanting to make some for my daughters too, but I don't seem to find time to make one. :( So, I was thinking "Aha! I can finally make bento meals with the Happy Paos!" So when we dined again at Chowking, I really made sure to order these Happy Paos for me and for my kiddos! So, here they are! Meet Panda Pao and Piggy Pao! Panda pao has chocolate fillings in it while Piggy pao has the traditional and tasty asado filling. Both variants tasted good. 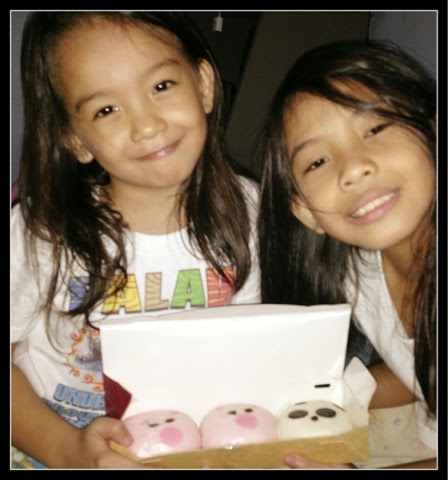 My daughters love them, especially the piggy pao. Each panda pao costs P39.00 if you order it ala carte and P49.00 if you prefer it to go with a drink. They also offer a to-go pack, consisting of three happy paos of your choice at the price of P117.00. Now, if you're gonna ask me how my bento plan worked, well, I haven't done one yet until now. Why? Because these happy paos are just too cute to resist! Every time I will buy these paos, my daughters will just immediately grab them, and eat them! Lol! I guess these happy paos are stand-alone bentos already, no need to further accessorize! By the way, Happy Paos are only available for a very limited time. So if you haven't tried these yet, you should try them now before they are finally gone! :) You sure don't wanna miss the smile and the happy feeling that these paos can give you and your kiddos! Go visit Chowking now! So cute! I have seen them in social media for a while but haven't gotten around to actually buying them. I'll look into buying soon!